Gathered from over a million anonymous devices worldwide, our statistics show which apps consume the most battery life, storage and data volume. In the eight years of smartphone evolution since the original iPhone, we’ve seen 4k displays, 8 core processors, and 4G mobile speeds that give many broadband connections a run for their money. What hasn’t changed much, is that your phone battery is mostly drained by the end of the day, your data limit gets capped before the end of the month, and your 16 GB of storage fills up after only months of using a new phone. But it’s not always the device at fault, with apps being largely to blame for the constant use of intense graphics, out-of-control notifications, and never-ending background checks that drain the battery. This is where our latest AVG App Performance & Trends Report comes in – Gathered from over a million anonymous devices worldwide, our statistics show which apps consume the most battery life, storage and data volume. We also provide a good idea about which apps are trending. What are the top app sinners this month? Ashley Madison. 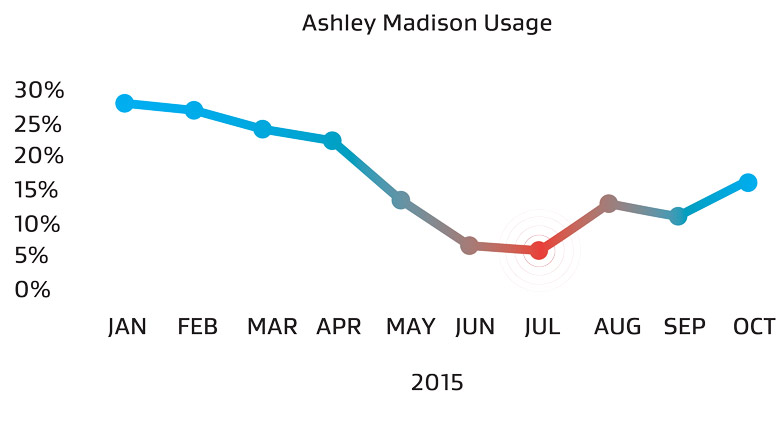 A sinner in the truest sense of the word, Ashley Madison app usage is back up to almost where it started – despite being the victim of a massive hack which saw millions of its cheating users leaked and potential lives destroyed. Running Out of Space? Facebook & Kindle Could be the Reason. When your phone is running low on storage, the first thing you usually do is delete photos and music, right? Not so fast! It’s also the data within apps that can amount to Gigabytes of hidden storage. According to our telemetry, Facebook, Kindle and the Japanese NTT Docomo Email Client rank among the top storage-eating apps that store more files for offline use than you might think. Look Who’s Talking Now: KakaoTalk & WhatsApp On the Rise. Facebook, Instagram and Google Play (the store app) are still in the top 10 resource-drainers, but now they’re joined by WhatsApp and KakaoTalk. Tamagotchi-esque Apps Making a Big Comeback, Draining Your Battery. Supercell, now coming in strong and only behind the literal King of the mobile gaming market, is now securing another spot in the top 10 most resource-hungry apps, with its Clash of Clans. Download the full Q3 2015 report here. What can you do to keep your apps under control? First of all, an app that appears on the top of our lists for storage, data or battery drain doesn’t mean they’re ruining the performance of your phone. It is important to weigh the pros and cons of running a good mix of apps that give you the desired results you want.